Firefighters assist in knocking down a recyclables fire in Corning, CA, that left 8,000 people without power. 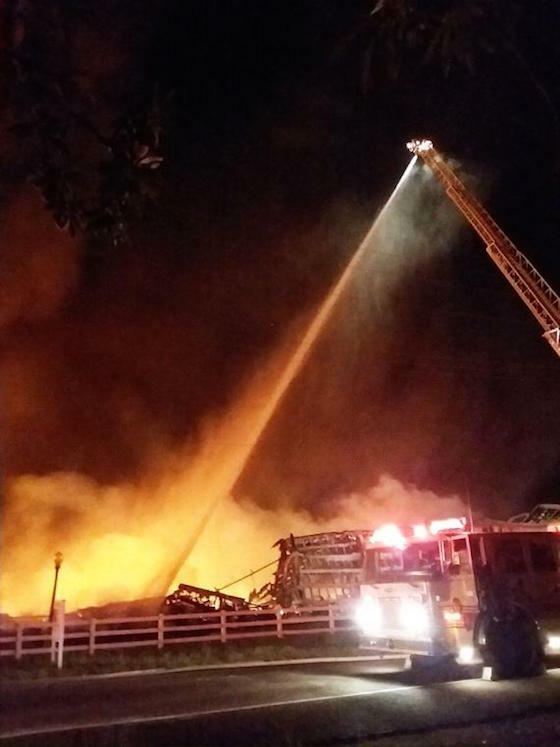 A recyclables fire in Corning, CA, left more than 8,000 people without power as first responders battled the blaze from Wednesday night through Friday. The fire began around 9 p.m. at Specialized Fibers, a recycling facility, and quickly engulfed two buildings between South and Kirkwood avenues. The intensity of the fire from its fiber fuel sources, recyclables like cardboard, forced firefighters to take defensive actions, said CalFire Capt. Scott Iohse. Power ended up restored to about 4,000 residents around 1 a.m., according to the Pacific Gas & Electric Co. outage map. Officials ordered a mandatory evacuation of South and Kirkwood avenues as crews worked to knock down the blaze. It will take days to let those huge piles of cardboard burn out, but the big concern is that there is a lot of toxic smoke from burning plastic – fortunately there is little wind this morning, so the smoke is travelling up and out, rather than into town, said CalFire Captain Gerrad Pasillas. Pasillas said this is a huge job and it will take at least several days to full put out the deep-burning piles of recyclable matter.